Download "II: CONSTITUENT UNIT BYLAWS Sections 5-12 Pages 2-3"
2 - 1 - CHAPTER I: COLLEGE BYLAWS Authorization 1. These Bylaws are authorized by Section of the Bylaws of the University of Nevada, Reno (UNR). Scope of the Bylaws 2. 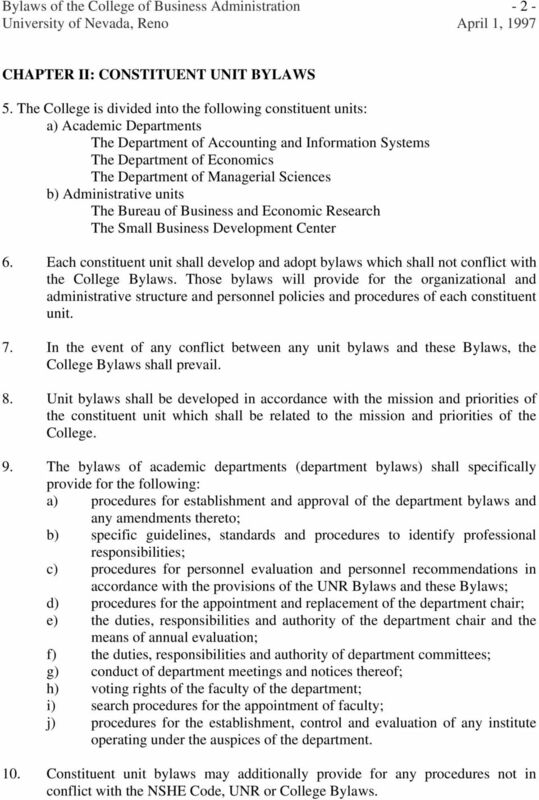 The Bylaws provide for the organizational and administrative structure and the policies and procedures for the faculty of the College of Business Administration (the College) as defined in Section 13 of these Bylaws. These Bylaws shall be consistent with the UNR Bylaws, the Nevada System of Higher Education (NSHE) Code, all laws of the State of Nevada and the United States. In the event of any conflict the UNR Bylaws, the NSHE Code or the laws of the State of Nevada, or laws of the United States shall prevail as appropriate. Adoption of College Bylaws 3. 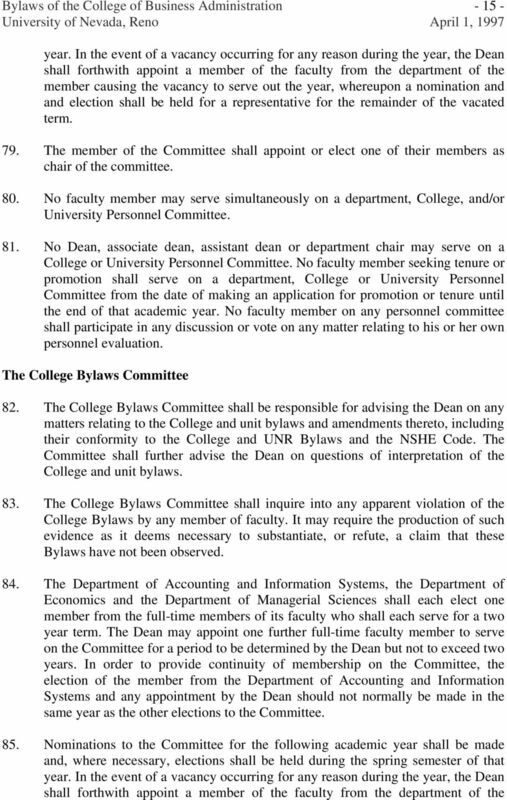 These Bylaws shall be adopted and in full force and effect upon: a) approval by the faculty of the College of Business Administration which shall be a simple majority vote obtained in a secret ballot conducted in accordance with Section 104 of these Bylaws; b) approval by the Dean of the College; and c) approval by the President. Amendments to the Bylaws 4. Any member of the College faculty, the President, Chancellor or the Board of Regents may propose amendments to the Bylaws. A proposed amendment shall be submitted in writing to the Faculty Secretary. 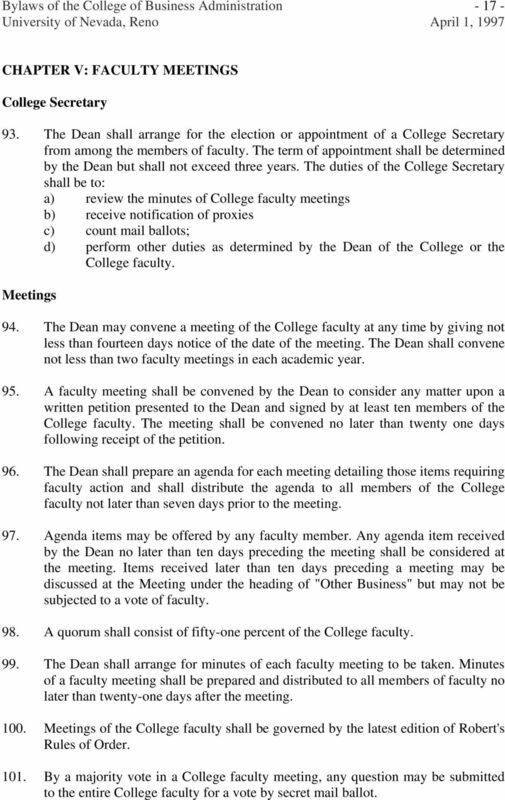 A proposed amendment shall be distributed to the College faculty for discussion in a properly faculty meeting. 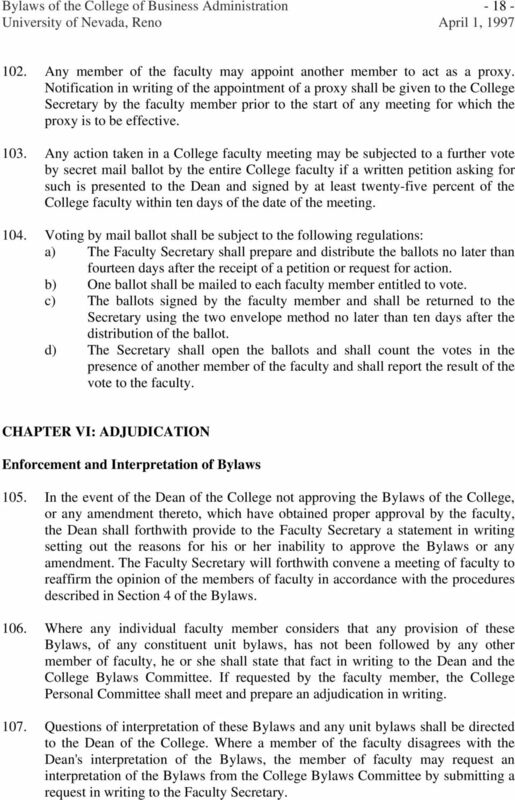 Any amendment shall be adopted upon: a) approval by the College faculty, which shall be a majority of two votes in favor to every one against of those voting in a secret ballot conducted in accordance with Section 104 of these Bylaws; b) approval by the Dean of the College; and c) approval by the President. 3 - 2 - CHAPTER II: CONSTITUENT UNIT BYLAWS 5. The College is divided into the following constituent units: a) Academic Departments The Department of Accounting and Information Systems The Department of Economics The Department of Managerial Sciences b) Administrative units The Bureau of Business and Economic Research The Small Business Development Center 6. Each constituent unit shall develop and adopt bylaws which shall not conflict with the College Bylaws. Those bylaws will provide for the organizational and administrative structure and personnel policies and procedures of each constituent unit. 7. In the event of any conflict between any unit bylaws and these Bylaws, the College Bylaws shall prevail. 8. Unit bylaws shall be developed in accordance with the mission and priorities of the constituent unit which shall be related to the mission and priorities of the College. 9. 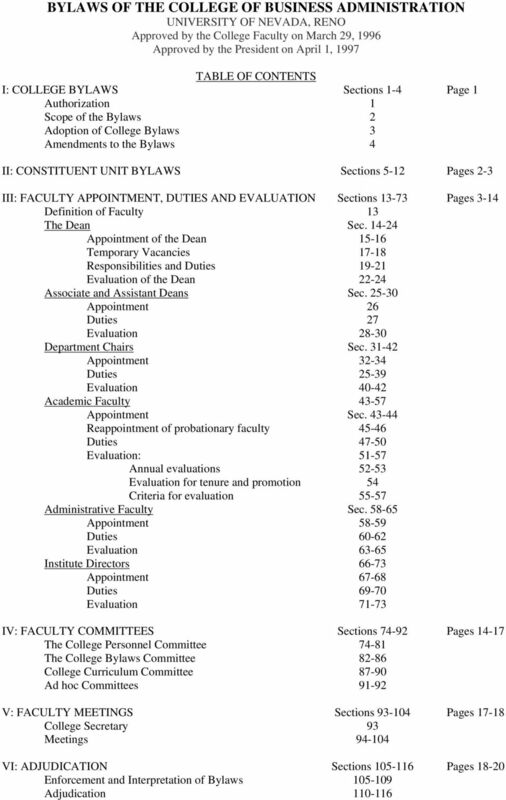 The bylaws of academic departments (department bylaws) shall specifically provide for the following: a) procedures for establishment and approval of the department bylaws and any amendments thereto; b) specific guidelines, standards and procedures to identify professional responsibilities; c) procedures for personnel evaluation and personnel recommendations in accordance with the provisions of the UNR Bylaws and these Bylaws; d) procedures for the appointment and replacement of the department chair; e) the duties, responsibilities and authority of the department chair and the means of annual evaluation; f) the duties, responsibilities and authority of department committees; g) conduct of department meetings and notices thereof; h) voting rights of the faculty of the department; i) search procedures for the appointment of faculty; j) procedures for the establishment, control and evaluation of any institute operating under the auspices of the department. 10. Constituent unit bylaws may additionally provide for any procedures not in conflict with the NSHE Code, UNR or College Bylaws. 6 - 5 - (a) (b) inform the faculty of actions of, or information from, the President, the Provost, or other university administrators which may be of significance to members of the faculty; inform the President, the Provost, or other university administrators of matters which may be of significance to members of the faculty as determined by the Dean. Evaluation of the Dean 22. An annual evaluation of the Dean shall be made by a committee comprising each department chair and the members of College Personnel Committee. The committee shall establish the criteria for evaluation in accordance with the role statement of the Dean and through consultation with the members of the college faculty. The committee must obtain input from the members of faculty through the use of a questionnaire, or similar instrument, of appropriate format devised by the committee. 23. 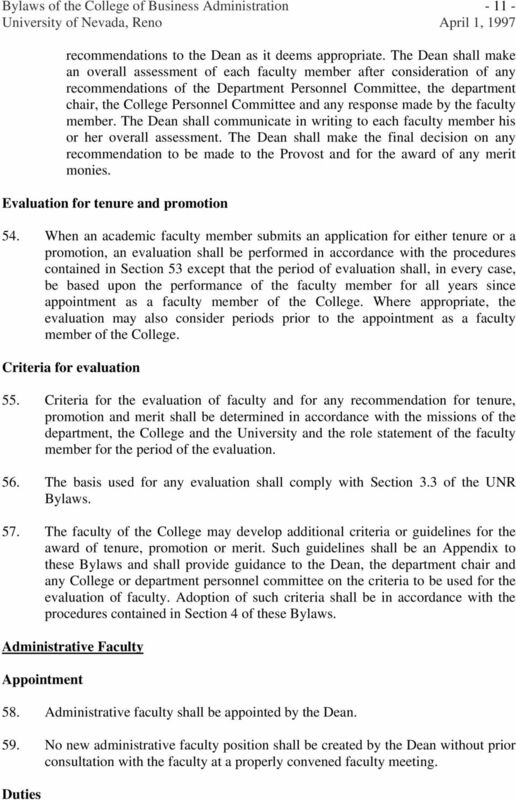 The committee's evaluation shall be presented to the Dean prior to it being forwarded to the Provost or the President. The Dean may, within fifteen days of receiving the committee's evaluation, make such comments as he or she deems appropriate. 24. The committee's evaluation of the Dean, together with any comments made by the Dean, shall be forwarded to the Provost and the President. Associate and Assistant Deans 25. The Dean may be assisted by Associate Deans and/or Assistant Deans. Appointment 26. Any Associate or Assistant Dean shall be appointed by, and shall serve at the pleasure of, the Dean. 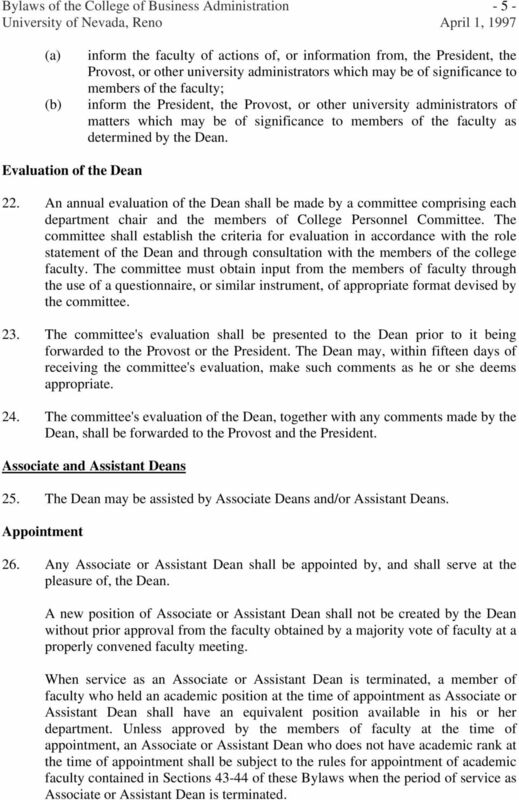 A new position of Associate or Assistant Dean shall not be created by the Dean without prior approval from the faculty obtained by a majority vote of faculty at a properly convened faculty meeting. 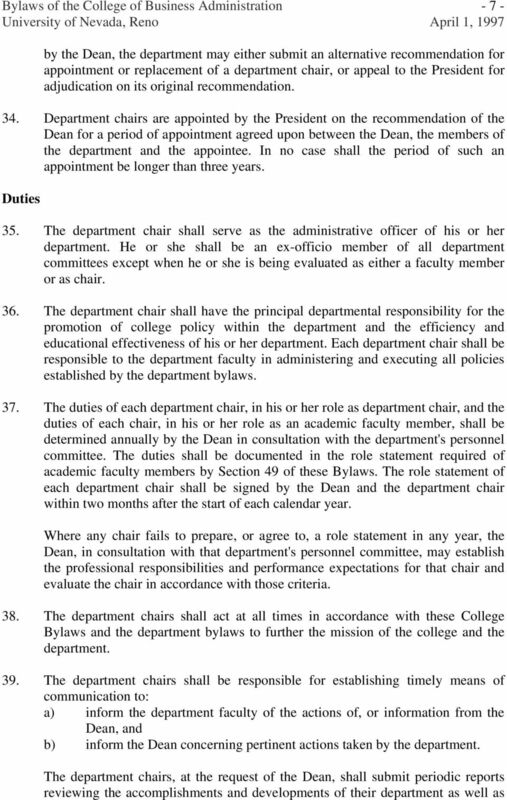 When service as an Associate or Assistant Dean is terminated, a member of faculty who held an academic position at the time of appointment as Associate or Assistant Dean shall have an equivalent position available in his or her department. 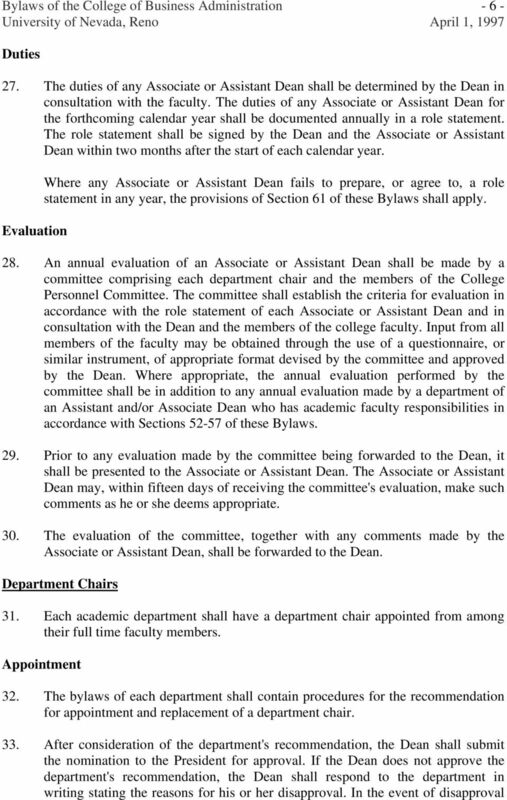 Unless approved by the members of faculty at the time of appointment, an Associate or Assistant Dean who does not have academic rank at the time of appointment shall be subject to the rules for appointment of academic faculty contained in Sections of these Bylaws when the period of service as Associate or Assistant Dean is terminated. 9 - 8 - Evaluation its future development. The Dean may request additional reports peculiar to individual departments. 40. An annual evaluation shall be made by the Personnel Committee of each department on the performance of its department chair in his or her role as chair. Such evaluation shall be in addition to the annual evaluation of the chairs as academic faculty members in accordance with Section of these Bylaws. Input from all members of the faculty of the department shall be obtained through the use of a questionnaire, or similar instrument, of appropriate format devised by the Department Personnel Committee. 41. Prior to any evaluation made by the Department Personnel Committee being forwarded to the College Personnel Committee or the Dean, it shall be presented to the department chair. The chair may within fifteen days of receiving the committee's evaluation make such comments as he or she deems appropriate. 42. The evaluation of the Department Personnel Committee, together with any comments made by the chair, shall be forwarded to the College Personnel Committee. The College Personnel Committee shall determine that any evaluation has been equitably performed in accordance with the College and department bylaws. The College Personnel Committee shall make a recommendation to the Dean in this respect and forward the evaluation to the Dean. Academic Faculty Appointment 43. The allocation, recruitment and appointment of faculty will adhere to the general provisions set forth in the UNR Bylaws. 44. Recruitment of new faculty shall be conducted by the department according to the procedures outlined in the respective department bylaws. The final nominees of the department are recommended to the Dean, who will evaluate the nominees in consultation with the department chair. The Dean's recommendation will be communicated to the department chair and submitted to the Provost. Reappointment of probationary faculty 45. Probationary faculty (those who have not been granted tenure) are offered annual extension of their contracts by the Provost on the recommendation of the Dean, according to UNR Bylaws. 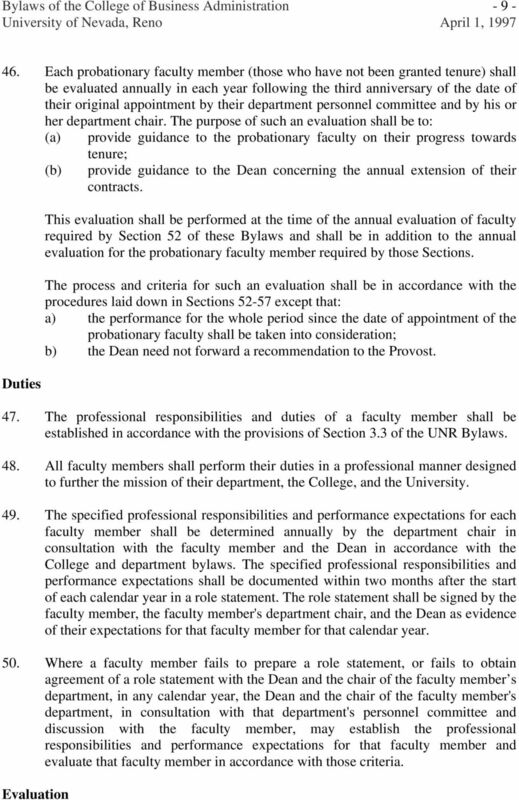 The Dean may act upon department recommendations, College Personnel Committee recommendations, or other criteria to recommend to the Provost that a probationary faculty member's contract of appointment not be renewed. 13 The specified professional responsibilities and performance expectations for each administrative faculty member shall be determined annually by the Dean in consultation with the faculty member and, where appropriate, the head of the unit or institute to which the faculty member is assigned. The specified professional responsibilities and performance expectations shall be documented within two months of the start of each calendar year in a role statement. The role statement shall be signed by the faculty member, the Dean and, where appropriate, the head of the unit or institute to which the faculty member is assigned as evidence of their expectations for that faculty member for that calendar year. 61. Where an administrative faculty member fails to prepare, or agree to, a role statement in any calendar year, the Dean, in consultation with the head of the faculty member's unit or institute to which that faculty member is assigned, and/or the College Personnel Committee, where appropriate, may establish the professional responsibilities and performance expectations for that faculty member and evaluate that faculty member accordingly. 62. 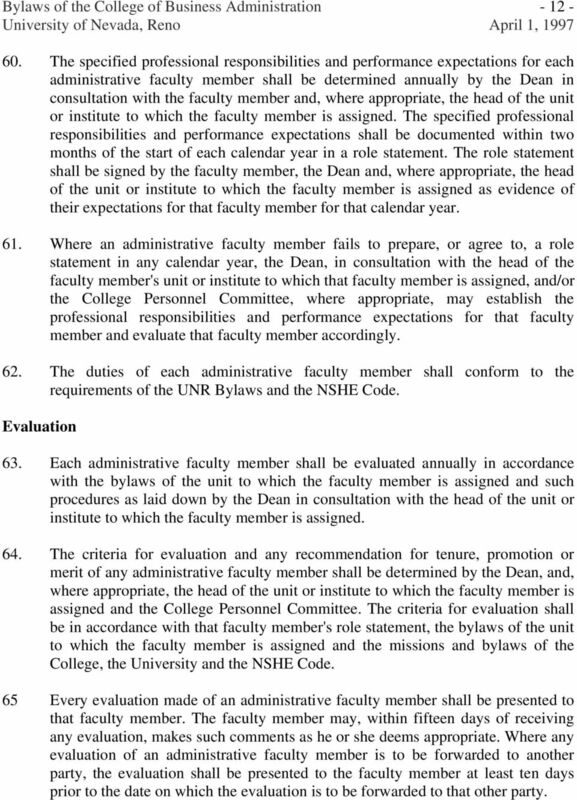 The duties of each administrative faculty member shall conform to the requirements of the UNR Bylaws and the NSHE Code. Evaluation 63. Each administrative faculty member shall be evaluated annually in accordance with the bylaws of the unit to which the faculty member is assigned and such procedures as laid down by the Dean in consultation with the head of the unit or institute to which the faculty member is assigned. 64. The criteria for evaluation and any recommendation for tenure, promotion or merit of any administrative faculty member shall be determined by the Dean, and, where appropriate, the head of the unit or institute to which the faculty member is assigned and the College Personnel Committee. The criteria for evaluation shall be in accordance with that faculty member's role statement, the bylaws of the unit to which the faculty member is assigned and the missions and bylaws of the College, the University and the NSHE Code. 65 Every evaluation made of an administrative faculty member shall be presented to that faculty member. The faculty member may, within fifteen days of receiving any evaluation, makes such comments as he or she deems appropriate. Where any evaluation of an administrative faculty member is to be forwarded to another party, the evaluation shall be presented to the faculty member at least ten days prior to the date on which the evaluation is to be forwarded to that other party. 14 Institute Directors 66. The Dean may establish institutes to further the mission of the College and may appoint academic or administrative faculty as institute directors. Appointment 67. No institute shall be established, nor any institute director appointed, without prior approval from the faculty obtained by a majority vote of faculty at a properly convened faculty meeting. 68. An institute director shall serve at the pleasure of the Dean. When such service is terminated, a member of faculty having an academic position at the time of appointment shall have an equivalent position available in his or her department. 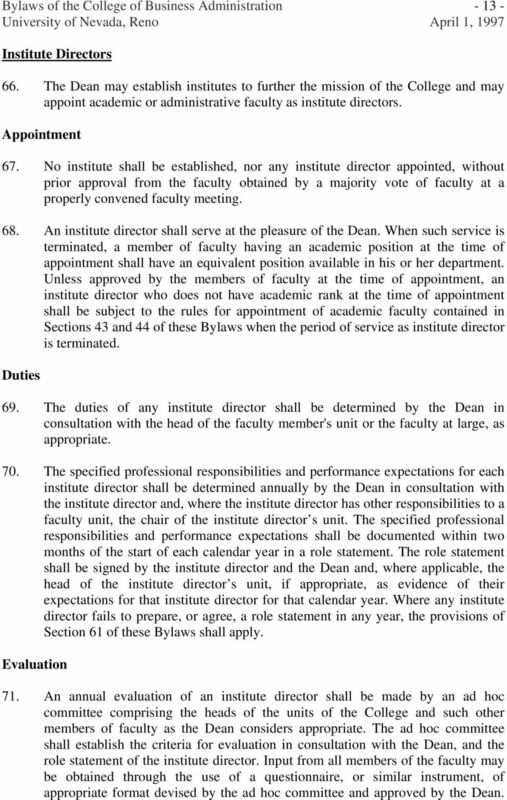 Unless approved by the members of faculty at the time of appointment, an institute director who does not have academic rank at the time of appointment shall be subject to the rules for appointment of academic faculty contained in Sections 43 and 44 of these Bylaws when the period of service as institute director is terminated. Duties 69. The duties of any institute director shall be determined by the Dean in consultation with the head of the faculty member's unit or the faculty at large, as appropriate. 70. The specified professional responsibilities and performance expectations for each institute director shall be determined annually by the Dean in consultation with the institute director and, where the institute director has other responsibilities to a faculty unit, the chair of the institute director s unit. The specified professional responsibilities and performance expectations shall be documented within two months of the start of each calendar year in a role statement. The role statement shall be signed by the institute director and the Dean and, where applicable, the head of the institute director s unit, if appropriate, as evidence of their expectations for that institute director for that calendar year. Where any institute director fails to prepare, or agree, a role statement in any year, the provisions of Section 61 of these Bylaws shall apply. Evaluation 71. An annual evaluation of an institute director shall be made by an ad hoc committee comprising the heads of the units of the College and such other members of faculty as the Dean considers appropriate. The ad hoc committee shall establish the criteria for evaluation in consultation with the Dean, and the role statement of the institute director. Input from all members of the faculty may be obtained through the use of a questionnaire, or similar instrument, of appropriate format devised by the ad hoc committee and approved by the Dean. 17 member causing the vacancy to serve out the year, whereupon a nomination and an election shall be held for a representative for the remainder of the vacated term. 86. The members of the Committee shall elect or appoint one of their members as chair of the Committee. College Curriculum Committee 87. The College Curriculum Committee shall be responsible for the review of any matter relating to the College and department curriculum and amendments thereto. The Committee shall further advise the Dean on any proposal to amend curriculum content prior to its implementation by the College or any department. 88. The Department of Accounting and Information Systems, the Department of Economics and the Department of Managerial Sciences shall each elect one member from the full-time members of its faculty who shall each serve for a two year term. The Dean may appoint one further full-time faculty member to serve on the Committee for a period to be determined by the Dean but not to exceed two years. In order to provide continuity of membership on the Committee, the appointment of the member from the Department of Accounting and Information Systems and any appointment by the Dean should not normally be made in the same year as the other appointments to the Committee. 89. Nominations to the Committee for the following academic year shall be made and, where necessary elections shall be held, during the spring semester of that year. 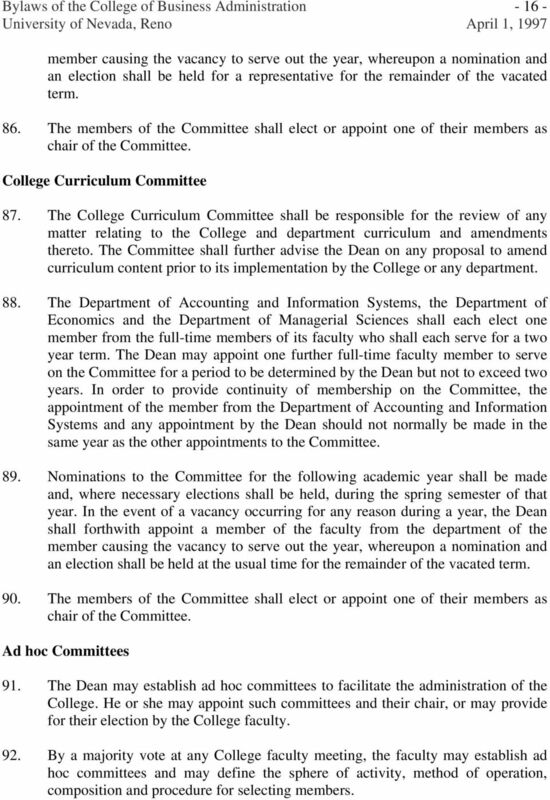 In the event of a vacancy occurring for any reason during a year, the Dean shall forthwith appoint a member of the faculty from the department of the member causing the vacancy to serve out the year, whereupon a nomination and an election shall be held at the usual time for the remainder of the vacated term. 90. The members of the Committee shall elect or appoint one of their members as chair of the Committee. Ad hoc Committees 91. 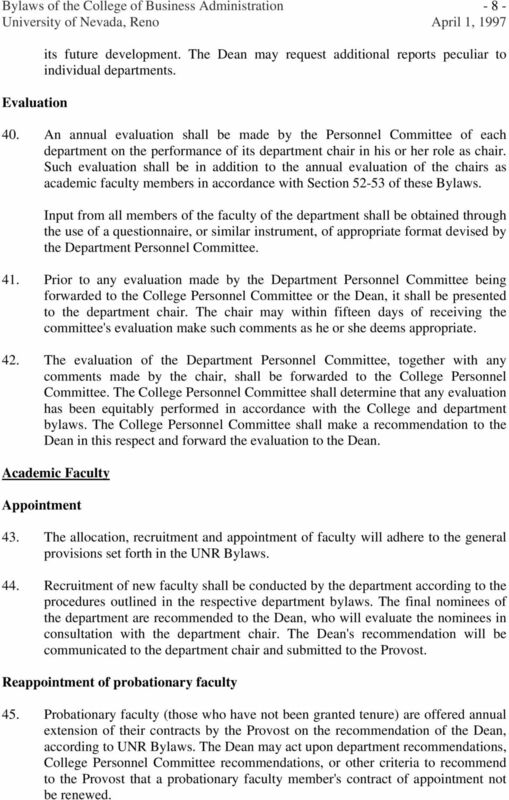 The Dean may establish ad hoc committees to facilitate the administration of the College. He or she may appoint such committees and their chair, or may provide for their election by the College faculty. 92. By a majority vote at any College faculty meeting, the faculty may establish ad hoc committees and may define the sphere of activity, method of operation, composition and procedure for selecting members. 18 CHAPTER V: FACULTY MEETINGS College Secretary 93. The Dean shall arrange for the election or appointment of a College Secretary from among the members of faculty. The term of appointment shall be determined by the Dean but shall not exceed three years. The duties of the College Secretary shall be to: a) review the minutes of College faculty meetings b) receive notification of proxies c) count mail ballots; d) perform other duties as determined by the Dean of the College or the College faculty. Meetings 94. The Dean may convene a meeting of the College faculty at any time by giving not less than fourteen days notice of the date of the meeting. The Dean shall convene not less than two faculty meetings in each academic year. 95. A faculty meeting shall be convened by the Dean to consider any matter upon a written petition presented to the Dean and signed by at least ten members of the College faculty. The meeting shall be convened no later than twenty one days following receipt of the petition. 96. The Dean shall prepare an agenda for each meeting detailing those items requiring faculty action and shall distribute the agenda to all members of the College faculty not later than seven days prior to the meeting. 97. Agenda items may be offered by any faculty member. 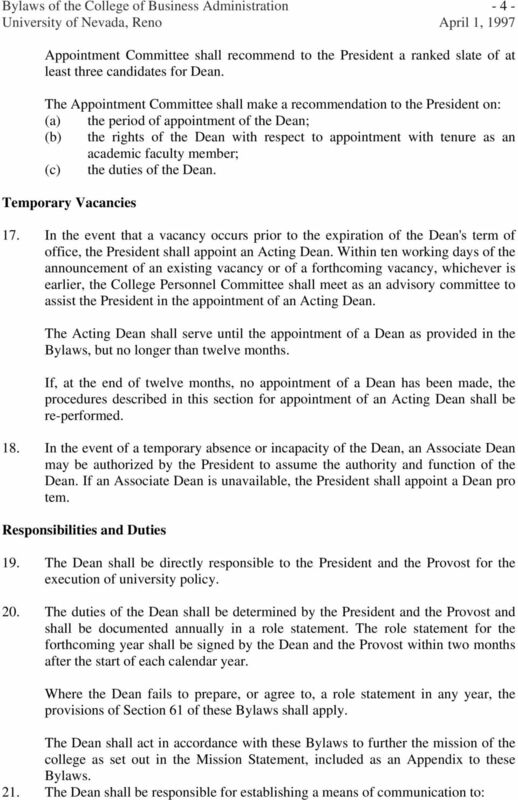 Any agenda item received by the Dean no later than ten days preceding the meeting shall be considered at the meeting. Items received later than ten days preceding a meeting may be discussed at the Meeting under the heading of "Other Business" but may not be subjected to a vote of faculty. 98. A quorum shall consist of fifty-one percent of the College faculty. 99. The Dean shall arrange for minutes of each faculty meeting to be taken. Minutes of a faculty meeting shall be prepared and distributed to all members of faculty no later than twenty-one days after the meeting Meetings of the College faculty shall be governed by the latest edition of Robert's Rules of Order By a majority vote in a College faculty meeting, any question may be submitted to the entire College faculty for a vote by secret mail ballot. 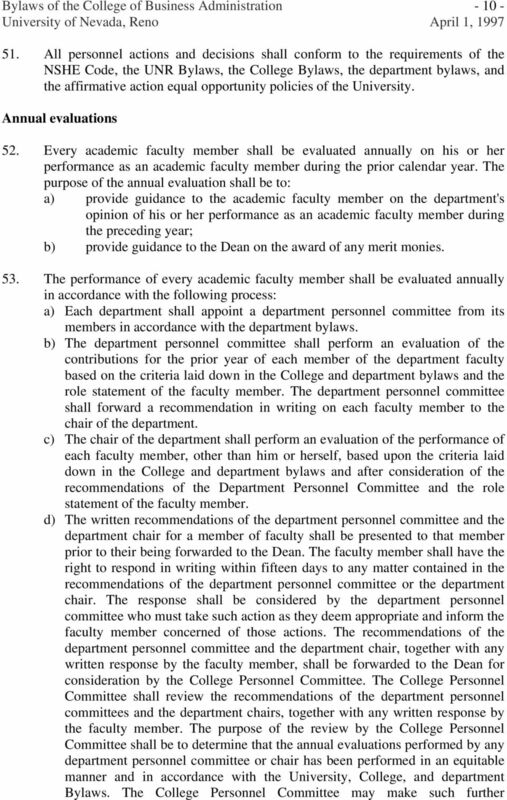 19 Any member of the faculty may appoint another member to act as a proxy. Notification in writing of the appointment of a proxy shall be given to the College Secretary by the faculty member prior to the start of any meeting for which the proxy is to be effective Any action taken in a College faculty meeting may be subjected to a further vote by secret mail ballot by the entire College faculty if a written petition asking for such is presented to the Dean and signed by at least twenty-five percent of the College faculty within ten days of the date of the meeting Voting by mail ballot shall be subject to the following regulations: a) The Faculty Secretary shall prepare and distribute the ballots no later than fourteen days after the receipt of a petition or request for action. b) One ballot shall be mailed to each faculty member entitled to vote. c) The ballots signed by the faculty member and shall be returned to the Secretary using the two envelope method no later than ten days after the distribution of the ballot. d) The Secretary shall open the ballots and shall count the votes in the presence of another member of the faculty and shall report the result of the vote to the faculty. CHAPTER VI: ADJUDICATION Enforcement and Interpretation of Bylaws 105. 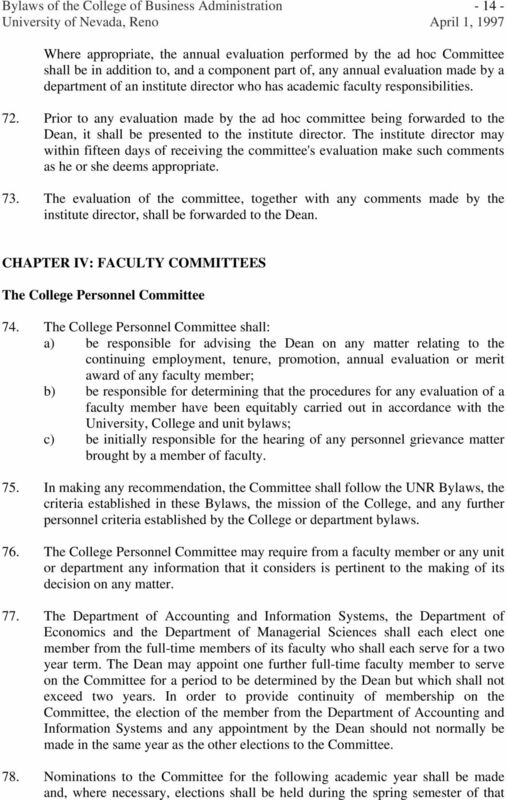 In the event of the Dean of the College not approving the Bylaws of the College, or any amendment thereto, which have obtained proper approval by the faculty, the Dean shall forthwith provide to the Faculty Secretary a statement in writing setting out the reasons for his or her inability to approve the Bylaws or any amendment. The Faculty Secretary will forthwith convene a meeting of faculty to reaffirm the opinion of the members of faculty in accordance with the procedures described in Section 4 of the Bylaws Where any individual faculty member considers that any provision of these Bylaws, of any constituent unit bylaws, has not been followed by any other member of faculty, he or she shall state that fact in writing to the Dean and the College Bylaws Committee. If requested by the faculty member, the College Personal Committee shall meet and prepare an adjudication in writing Questions of interpretation of these Bylaws and any unit bylaws shall be directed to the Dean of the College. Where a member of the faculty disagrees with the Dean's interpretation of the Bylaws, the member of faculty may request an interpretation of the Bylaws from the College Bylaws Committee by submitting a request in writing to the Faculty Secretary. 20 On receipt of a request from a faculty member, the College Bylaws Committee will convene a meeting and will prepare an interpretation in writing Adjudications and interpretations of the Bylaws by the College Bylaws Committee shall not be binding on the faculty member or the Dean. In the event of disagreement, either the faculty member or the Dean may seek further adjudication in accordance with Sections of these Bylaws. Adjudication 110. 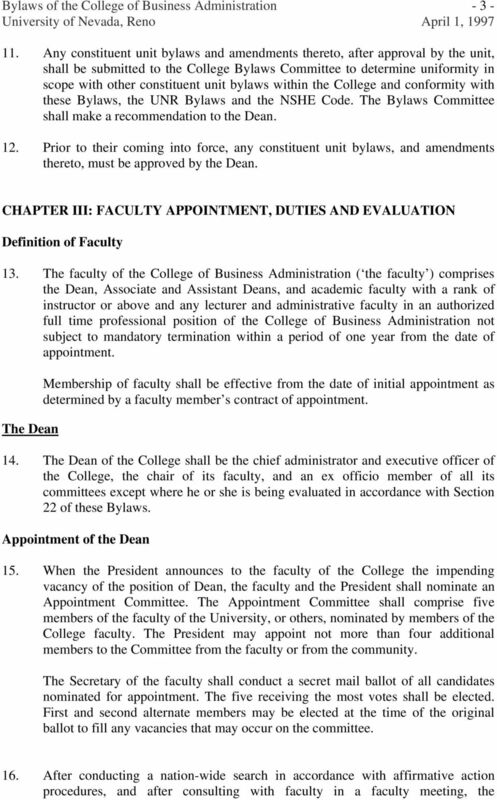 Where resolution of any issue in dispute between the Dean and the members of faculty as a whole cannot be achieved, the members of faculty may appeal to the President for an adjudication or for the appointment by the President of an adjudication committee. 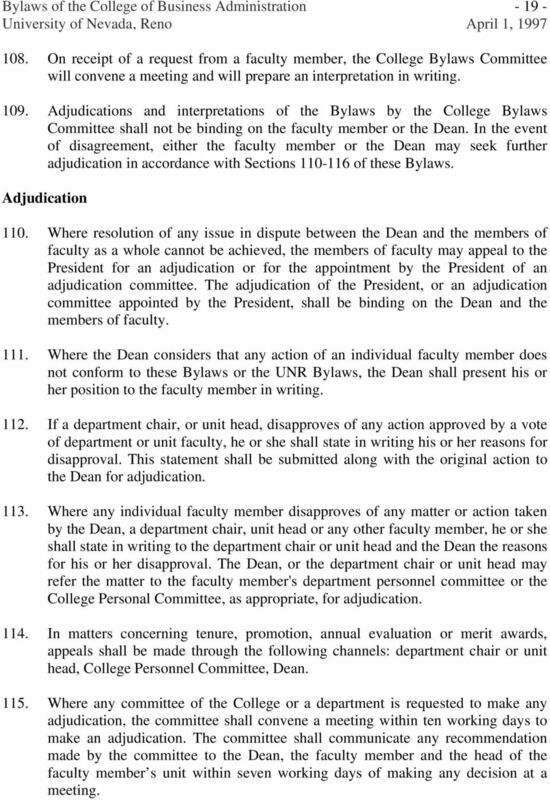 The adjudication of the President, or an adjudication committee appointed by the President, shall be binding on the Dean and the members of faculty Where the Dean considers that any action of an individual faculty member does not conform to these Bylaws or the UNR Bylaws, the Dean shall present his or her position to the faculty member in writing If a department chair, or unit head, disapproves of any action approved by a vote of department or unit faculty, he or she shall state in writing his or her reasons for disapproval. This statement shall be submitted along with the original action to the Dean for adjudication Where any individual faculty member disapproves of any matter or action taken by the Dean, a department chair, unit head or any other faculty member, he or she shall state in writing to the department chair or unit head and the Dean the reasons for his or her disapproval. The Dean, or the department chair or unit head may refer the matter to the faculty member's department personnel committee or the College Personal Committee, as appropriate, for adjudication In matters concerning tenure, promotion, annual evaluation or merit awards, appeals shall be made through the following channels: department chair or unit head, College Personnel Committee, Dean Where any committee of the College or a department is requested to make any adjudication, the committee shall convene a meeting within ten working days to make an adjudication. The committee shall communicate any recommendation made by the committee to the Dean, the faculty member and the head of the faculty member s unit within seven working days of making any decision at a meeting. 21 Any adjudication or decision made by a department chair or unit head, the College Personnel Committee, the College Bylaws Committee or the Dean shall not preclude any member of faculty from pursuing the grievance procedures contained in Section 3.2 of the UNR Bylaws. 1 COLLEGE OF MUSIC CHARTER AND BYLAWS Amended by the faculty May 8, 1999. Revised by the FAC 2006, and 2008-2009. Ratified by the College of Music Faculty, October 26th, 2009. Revised by the FAC 2009-2010. 3359-10-02 The university of Akron bylaws of the faculty senate. Name. The name of this body is the faculty senate of the university of Akron. CONSTITUTION. This organization is the Central Michigan University Alumni Association ( Association ).